I'm an upcoming UF Freshman looking to help. I've taken a multitude of tough classes and am looking forward to helping others. I have experience tutoring math and science from my High school. I have passed 13 AP Exams thus far some of which include: AP Calculus AB/ BC, AP Chemistry, and AP Physics. I grew my SAT score from a 1380 to a 1540 over the course of a year from books and online resources. I've tutored classmates for community service for the past two years and clients on other platforms starting over the summer of 2018. My strongest subject is in math, over my high school career I've taken courses from Algebra I to Calculus III. This is also my most frequent tutoring request which I have done numerous times. Chemistry and Physics are also strong subjects for me. I did well on both of the AP Exams and am taking PHY 2048C at CF. For chemistry and physics, I would host review sessions and teach small groups of students the material needed for AP Exams. I would even make videos and post them online through a private link. I'm helpful with students and understanding per situation. As a student, I am aware that not everyone learns the same and I adapt my teaching for each student of mine. I have a passion for helping others and willing to do at an affordable rate. Rate details: Rate is subject to the difficulty of subject and necessary lesson prep before hand. 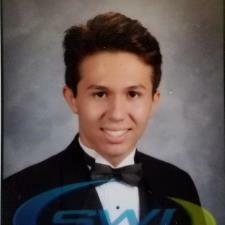 I am currently a senior in High School and took AP Chemistry last year my junior year. I got a 4 on the exam and am currently studying for the SAT Chemistry exam. I know a good amount about how the test is structured and have many review books to pull material from. I passed the AP Physics I exam and got a 700 on the SAT Physics Subject Test. I scored a 1450 SAT (800 M) when I took it on October 06, 2018. Through my studying and experience I know for the most part math topics that tend to show up most tests. I am also familiar with the skills needed to master for those few questions that decide an 800. I scored a 1540 when I took the SAT in December 2018. Alejandro is both knowledgeable and easy to relate with. He explains topics well. He is both thorough and efficient. I like that he works the entire problem out, several questions, and then once you have the gist of the topic, he shows you the smarter easier way to evaluate and solve the problem. I highly recommend him as a tutor. Without him I would fail my general chemistry course. My instructor is too fast paced but Alejandro provides the one to one lesson that I need, in order to pass this course. I am so grateful to have found him! This is our second lesson and I feel way more confident then I did previously. Alejandro really helped my son grasp the concepts being taught in his AP Chemistry class. It was the first time my son said with confidence he understood the problems. Really excited for my son to continue working with Alejandro. He is extremely knowledgeable and friendly. He came prepared to answer any questions on the topic that was given. We went over a practice test from a 2nd term college level course. He knew how to explain in an understandable manor, even for a “beginner”. Went over solubility (Finding Ksp and S) as well as Thermodynamics (Disorder, Entropy). Would definitely reach out again! Alejandro helped me understand certain concepts that I was struggling with in class. Also, showed me different ways to solve problems which lead to a better understanding of the math portion of Chemistry. Alejandro worked with my daughter to help her in her AP Chemistry. He was very knowledgeable and patient while working with her. This was our first experience with online tutoring and it was a positive one.